NEW ORLEANS, Louisiana (CNN) -- Police and National Guard troops struggled to restore order Thursday in New Orleans and worked to evacuate tens of thousands of people, who are growing weaker and more desperate in the flooded city. Thousands of people slept on streets, interstate access ramps, bridges or any dry spot they could find. Outside the New Orleans Convention Center, a huge crowd waited on the sidewalks for aid that could be a long time coming. 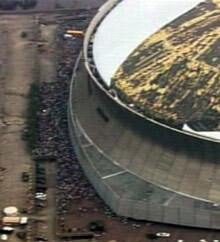 The building was used as a secondary shelter when the Louisiana Superdome was overwhelmed. CNN's Chris Lawrence reported that conditions inside the building were extremely bad -- a number of bodies were visible, including a baby.